Two decades ago when I met my wife, she introduced me to a ceremony of balancing eggs on their ends at the exact moment of equal day and night in our portion of the northern hemisphere. I scoffed internally, but, out of love and half asleep, went along with the 2:00 am ceremony. When at the exact moment of the Equinox, my egg snapped to attention, upright and perfectly balanced, almost like a gravitational field had pulled it upright, I was blown away. I became a believer. For every year since on the equinox in spring and fall, I have balanced my eggs. Sometimes they stand for several days before toppling over, as usually happened when our then young son ran through the dining room. But never a year when the eggs did not balance. Now some have suggested that, with extreme patience and a little glue, you can balance an egg on its end at any time of the year. Heresy! Consider the science of this. The axis of Earth is at 90º to the sun only twice a year in our tiny part of the world. Balance is perfect. No wonder the ancients took this time to cleanse, restore balance in their lives and begin to spin stories of the rebirth of the Sun King. It’s all geography. That’s why the federal government released its budget this week … everything in balance, Well, for sure by 2023 … on the egginox. You may laugh, but this afternoon, at exactly 5:58 p.m. eastern time, I will be at our dining room table, balancing our free-run, organic, Omega 3 enriched Golden Girl eggs. 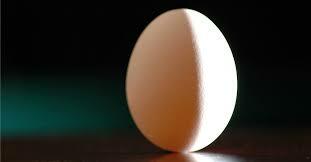 I may not have faith in Conservative politicians, or in organized religions, but I have seen the Egginox light. And I believe! p.s. You think we don’t have Passover eggs and Easter eggs for a reason? Really?